American Suzuki Motor Corporation (“ASMC” or “the Company”), the sole distributor in the continental United States of Suzuki Motor Corporation (“SMC”) automobiles, motorcycles, all-terrain vehicles and marine outboard engines, today announced that it plans to realign its business to focus on the long-term growth of its Motorcycles/ATV and Marine divisions. Polaris Defense, a division of Polaris Industries Inc. (NYSE: PII), is showcasing two advanced vehicle technologies, designed to address the U.S. military’s need for increased vehicle survivability, at the AUSA 2012 Annual Meeting & Exposition. As the race clock quickly clicks down to 30 days remaining before the green flag drops and as teams finalize logistics, vehicle prep and prerunning trips, entries continue to arrive from around the globe for November’s 45th anniversary of the Tecate SCORE Baja, the legendary granddaddy of all desert races. Veteran Arizona desert racer Pete Sohren has received the first starting position during Saturday’s live drawing at the Off-Road Expo for November’s 45th running of the legendary Tecate SCORE Baja 1000 desert race. 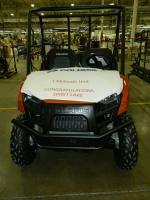 Polaris Industries Inc. (NYSE: PII) announced that the one millionth product, an orange Polaris RANGER 800 Midsize side-by-side vehicle, rolled off its Spirit Lake, Iowa assembly line. The 2012 Lucas Oil Off-Road Expo powered by General Tire will return to the Pomona Fairplex Saturday, October 6 through Sunday, October 7, with the Off-Road Business Association (ORBA) as the official event charity. Advance tickets purchased with the special promotion code ORBA at www.offroadexpo.com will net $1.00 for every ticket sold to ORBA. Lake Elsinore Motorsports Park has announced completion of a dedicated ATV, Side-by-Side and Trophy Cart track. With a layout filled with obstacles, the track was designed to challenge riders of all skill levels. The track will open on Saturday morning, October 6th at 9:00 am. The American Sand Association is an all volunteer-run organization that relies on memberships, business sponsors, and donations to effectively fight the current Land Use issues at the Imperial Sand Dunes Recreation Area. Polaris Industries Inc. (NYSE: PII), the leading manufacturer of off-road vehicles, today announced the company has donated a total of 28 Polaris all-terrain vehicles (ATVs) and safety gear to the Boy Scouts of America’s Northern Star Council’s Tomahawk Scout Reservation, the second largest Boy Scout camp in the nation, and the Northwoods Camp, run by The Salvation Army, the world-wide leader of social, youth and rehabilitative services. The donation, valued at $100,000, is part of Polaris’ long-term partnerships with the two organizations, focused on youth ATV safety practices and outdoor sports. Send an Email Urging Your Representative to Cosponsor H.R. 999 — The ROV In-Depth Examination Act, or RIDE Act!